When it comes time to begin a kitchen remodel for your home in Lexington, Kentucky, or a nearby city, the name you can trust to provide the type of outstanding products and client-centered service you deserve is BACK Construction. We are a longstanding home improvement remodeler that has made kitchen renovations memorable and enjoyable experiences for our countless satisfied clients. With BACK Construction on your side, you’ll enjoy partnering with a company that takes an all-in-one approach. 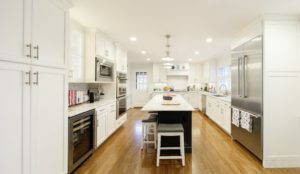 Our team of experts work seamlessly together to ensure that you have proper, honest guidance throughout the kitchen remodel and that all of your needs are being met. From the consultants and designers to the installers who will carry out your vision, everyone on our team is committed to creating a beautiful, personalized kitchen that you can use well into the future. In assurance of the confidence we have in our capabilities, we cover our work with a five-year workmanship warranty. To see the many ways we build it BACK better, contact us today. We take plenty of pride being a go-to kitchen remodel company serving Lexington, KY, and nearby cities.